As discovered by Ana Soto and Carlos Sonneschein (OSF Chapter 8), nonylphenols are estrogen mimics that bind with the estrogen receptor and provoke estrogenic reponses, both in vivo and in vitro. Originally thought to be inert, and indeed used as an "inert" ingredient in many pesticides because of their surfactant characteristics, nonylphenols have now been shown to have many biological effects, at least in laboratory studies (e.g., on salmon osmoregulatory control). With this publication, Guenther et al. report that nonylphenols are present in a wide variety of foods bought in German marketplaces, everything from gooseberry marmalade to liver sausage to chocolate crumble to doublecream cheese. All samples exampled contained measurable amounts of nonylphenols. Unfortunately, the work reveals only the widespread presence of nonylphenols, not how the food became contaminated. Hence more work will need to be done before steps can be taken to reduce contamination. What did they do? Geunther et al.purchased 39 samples of adult foods and 20 baby foods in supermarkets in Germany. Their choice of foods was guided by a national survey of German food habits, with an explicit effort made to obtain representatives of each of the major food types identified in the survey as being common in German diets. In their purchasing they also explicitly attempted to buy from the most popular product lines. They also obtained a sample of breast milk from one lactating 35-yr old woman. Each sample of food was stored until analysis at 4°C. With the liquid foods, the chemical analysis of nonylphenol content was carried out with the liquid food without further preparation; solids were first homogenized using a blender. Each sample was put through a series of steps, first to isolate the organic fraction of the sample and then to measure the concentrations of different forms of nonylphenols, using a gas chromatograph/mass spectrophotometer procedure. Prior to each analysis, the equipment was cleansed with nitric acid to remove any potentially-contaminating residues. "...high concentrations of NPs were not only found in fatty food like e.g. butter (14.4 µg/kg), lard (10.2 µg/kg), or liver sausage (13.0 µg/kg) but also in nonfatty food like e.g. marmalade (7.3 µg/kg), apples (19.4 µg/kg), or tomatoes (18.5 µg/kg)." The following graph from Guenther et al. summarizes nonylphenol levels in milk and chocolate products. 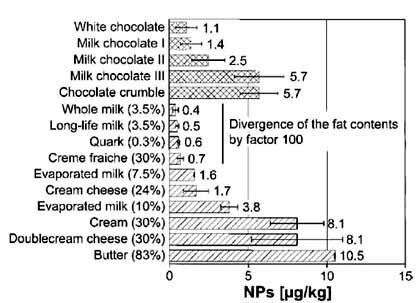 The authors make the point that the milk results presented here demonstrate that fat content of the foods did not control NP levels: the four different types of milk in this graph varied in fat content by a factor of >100. What does it mean? At least in the present food-delivery system of Germany, it is impossible not to consume small levels of nonylphenols on a daily basis, from virtually everything food item eaten. There is no reason to think that German food is substantially different from any commercially-prepared food anywhere. Using data on the average food consumption patterns of Germans, the authors were able to calculate an expected average daily intake of nonylphenol: 7.5 µg/day for adults and 0.2-1.4 µg/day for infants. The lower value for infants was for babies exclusively breast-fed. The authors do not point out that average figures can be misleading when thinking about risk. 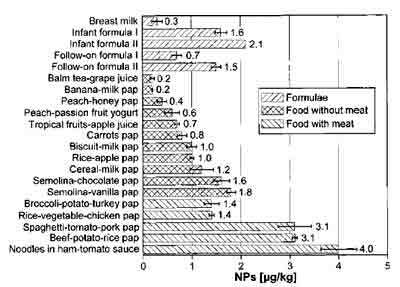 The averages summarize complicated statistical distributions, both for the amounts of different food types consumed and the NP levels within each food type. 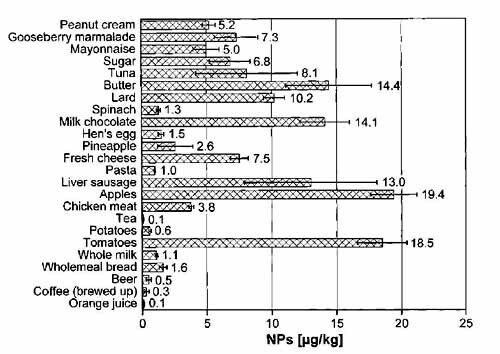 Some percentage of the people represented by those averages are unquestionably consuming far higher levels of NP daily. What percentage will depend upon the underlying distributions. At this stage it is not possible to identify the exposure pathways by which these foods became contaminated. Guenther et al. point out that the foods examined differed substantially in preparation methods and in packaging, and hence there can't be a single entry point for nonylphenols into the food supply. "A part of it could originate from NPEs which are used as nonionic surfactants in disinfectants and cleaning agents or as emulsifiers in pesticide formulations. After application in stables or food industries and in agriculture, respectively, degradation of NPEs could lead to the accumulation of NPs in food. In particular, the high concentrations of NPs in apples and tomatoes could be consequently attributed to pesticide application. Then, the lipophilic NPs would be accumulated in the wax coats of the fruits and vegetables, respectively. Another source might be plastic packaging materials from which NPs, used for example in tris(nonylphenol)phosphite as antioxidant, could migrate into food."